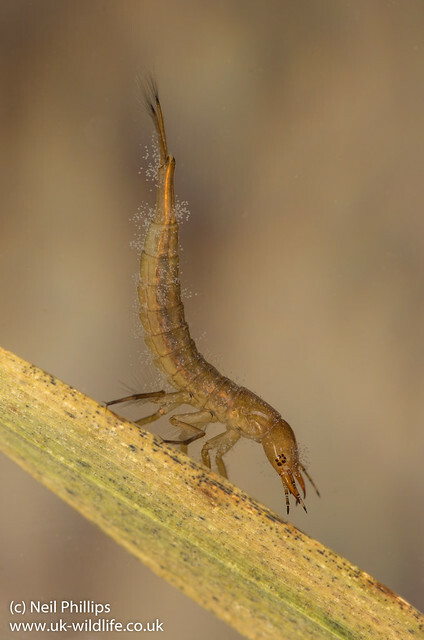 Another quick photo post, this time of a diving beetle larva. This beastie is famous for being a ferocious predator, sometimes attacking prey bigger then itself with its large pincer like mouthparts. They even eat each other! If you look closely you can see its covered in what looks like white fuzz. These are another organism, probably Vorticella sp. which are a type of ciliate. These are a complex single celled organism, which have a mouth surrounded by small hair like cilia, which move to create a current that directs food into the mouth. It feeds on microscopic algae and bacteria. The main body of the cell is is attach to a hard surface, often plants or an animal, by a stalk which can rapidly retract if it needs too. Just shows pond creatures are not just interesting themselves, they even have interesting creatures attach to them!